I got this idea from Baby Rabies and you can go here for her easy tutorial. 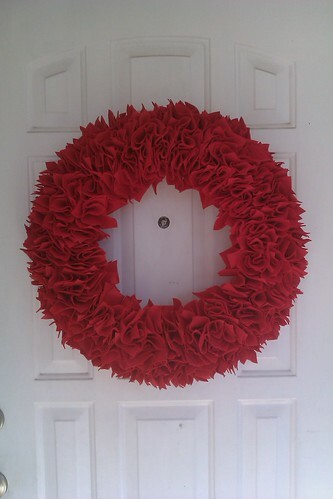 The only thing I did different - I used a 18 inch wreath so I needed 2 yards of fabric. I had to buy more fabric so I did mine over a few days, but it really only took about 2 hours or so to make. It looks great on the door and if I want I can put it up again in February! I love it! I will have to keep this in mind! I LOVE this wreath. I'm gonna have to make that.